Its official, the Players Lounge is now open and Pattaya’s new golfing outlet kicked off with a two-man better ball at Green Valley, followed by a buffet and karaoke night at the club premises on Soi Wat Sutthawas near to and on the same side of the soi as the Courtyard Pub. Terry Mangan & Ed Junger collect their prizes from Bob Newell. The scoring was of an excellent standard as GM ‘Broad more’ Bob and Simon Philbrook teamed up to take the fourth place with a 47-point return. The pairing of Chaten ‘the Rajah’ Patel and Barry ‘the boot’ Copestake put together a very useful 49 to take the bronze, this was a shot adrift of runners up Eddy ‘the Eagle’ Beilby and Peter ‘the Right Honorable’ LeNoury with a superb 50 points. Terry Mangan, along with his good friend Ed Junger, celebrated Terry’s birthday in style as they took the days honours with a fantastic 51 points. The GM thanked everyone that took part for making it a great success and said a special thanks for all the hard work put in by the staff. The inaugural ‘Saturday Bash’ at Green Valley attracted a small but talented field and a couple of familiar names. Aberdeen’s favourite son Mark Wood and ‘Broad more’ Bob used their coarse knowledge to navigate to first and third respectively. 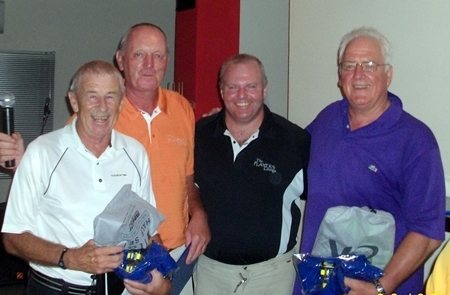 Sitting betwixt them and clutching the silver was Aussie Jimmy ‘AK47’ Bell who was but one stroke shy of the top spot. Bob Newell was sole heir to the ‘2’s pot. Note: The Players Lounge will be playing golf competitions on Tuesdays, Thursdays and Saturdays and also a monthly medal comp. If you want a game with us, the sign-up sheets are in the bar or otherwise give Bob a call on 080 096 8232.